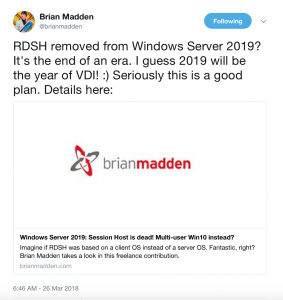 A few weeks ago, Microsoft delivered a first preview of Windows Server 19 and since then, the IT community has been speculating at how Microsoft will deliver Remote Desktop Services. Some would argue that Microsoft was “light” on the details in that preview so you have some of the biggest names in IT trying to read between the lines: from VMware’s Brian Madden and tech author Mitch Tulloch to ZDNet’s Mary Jo Foley, industry experts are weighing in on all the things around the fall release. While opinions about what’s around the corner have varied, one thing is for certain: the preview created a lot of buzz. Specifically, what could be the impact of multi-session capabilities in Windows 10? How would this affect TCO? A2U’s very own experts Dan Dillman, CEO and Cliff Miller CTO speculate on what this could mean from their vantage points, discussing what they think is a possible reality for the future of published apps and hosted desktops. 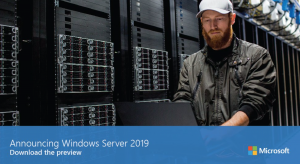 The two prefaced the interview by saying, today’s commentary is all their professional opinion as the world is still waiting to see the finished Windows Server 2019 product. Press play to listen to the interview below with Dan and Cliff. That was A2U executives’ first take on the preview but what do you think? Any ideas about what changes we’ll see in the Windows 10 fall release and how this will impact the work that is done in our industry? Please send your thoughts to marketing@a2u.net. Tune in here and on A2U’s Facebook and Twitter pages to hear more on what Dan and Cliff have to say as more details surface. In the meantime, you can read up more on the news at the Windows Server Blog and check out the Release Notes here.